Related species include aloe, lily, hosta, asparagus, day-lily, tulip. Leaves with long arching blades to 24 inches long and 1 inch wide, green. The common variegated leaf forms are marked with white (‘Variegatum’ and ‘Vittatum’) or yellow (‘Mandaianum’) bands. Plants form offsets (plantlets) resembling miniature plants at ends of flexible stems. Best used in hanging baskets. Somewhat chill sensitive, store above 50F. The specific epithet name of “comosum” means long hair, probably in reference to the long leafless stems extending out with small plants forming at the ends. In the wild, these plantlets can root when they touch the ground and thereby help propagate themselves. 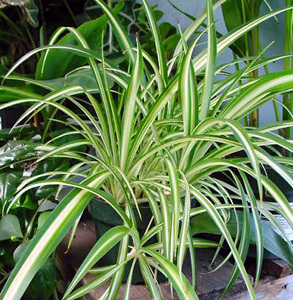 Chlorophytum: Greek for green in reference to the foliage. Besides having foliage with yellow bands, ‘Mandaianum’ is smaller in size compared to the species. The basic green foliage type generally does better under home environments than the variegated one with white and green leaves. The reason is believed to be simple: more chlorophyll (green pigment) means more photosynthesis (food production) under low light environments. Giese et al. (1994) showed that cell cultures of this species could detoxify formaldehyde and turn this dangerous chemical into common plant compounds such as sugars, organic and amino acids. On a more useful note and as summarized by Brown (1988) and by Wolverton et al. (numerous years), this is one of many foliage and flowering plant species that can remove air pollutants such as formaldehyde and/or benzene often found in cigarette smoke from interior environments. Indeed, a breath of fresh air awaits custodians of spider plants!